Standing on a sidewalk eating something from a cone or a wrapper or a stick or a cone-wrapper-stick is just something very LA-ish. We're outside, we're in our cars, we're on the move. Tables are so square. So in a city blessed with myriad mobile, on-the-go gastronomical choices, it makes sense that one of the area's most famous eateries has put pedal to metal. 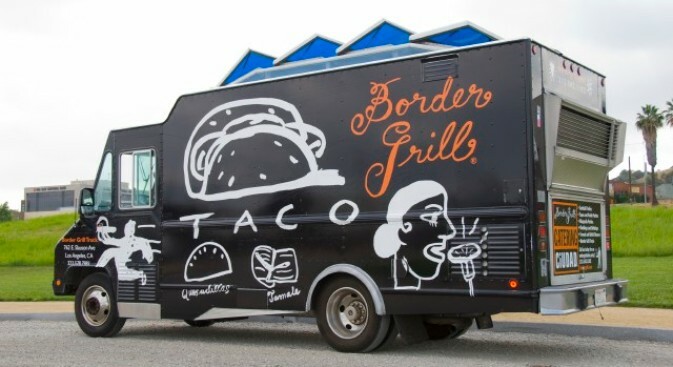 Border Grill now has its own spankin' new truck, and it has already showed up at spots like LA Pride, the Lakers blowout, and Melrose Trading Post. We're pausing the daydream about the joy of finding a mustard-yellow Googie 1960s lamp at Melrose Trading Post for five bucks only to see the Border Grill truck pull up with a cheese-melty quesadilla for us. Okay, daydream over. Nice. You can see where the cafe-on-the-go is showing next by checking out the truck's Twitter and Facebook pages. Spicy cold ceviche and savory tacos, enjoyed while lingering on some sidewalk, just ahead.